The modern.toronto is honoured to present a survey of works by acclaimed sculptor André Fauteux. 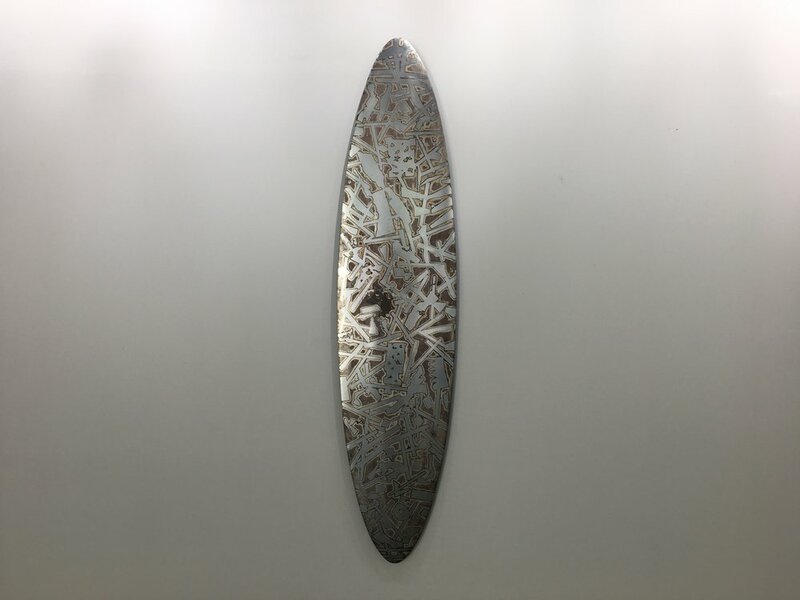 The exhibition includes pieces from the 1980s to the early 2000s, presenting ten abstract welded sculptures in diverse metals such as brass, galvanized steel, Corten and forged steel. Sections of some sculptures have been dipped in chrome, giving them a high polish, contrasting with other sections left raw, or coated with layers of polychrome colour and iridescent pigments. Fauteux’s sculptures are anchored in the formalist abstract theories of Clement Greenberg and inspired by his time working with the renowned sculptor Sir Anthony Caro at York University in the 1970s. These ardent main principles are manipulated with a subtle, lyrical sensibility to create an asymmetrical presence. Fauteux sees his process as “three-dimensional collage” that is felt and shifted intuitively by his hands as he progresses in creating a sculpture. The artist considers Present Sense (2002-03) and Piano Four Hands (2002-03) exemplars of his process. Both pieces have a solid centre that is juxtaposed with gestural lines and abstract shapes imparting to each piece a formal presence. However, a present sense like watching four hands play a piano is an impression of what one sees and hears, and much more. It is not symmetrical or readily understood, but instead conveys an inspired moment captured in metal. The earliest piece in the exhibit, Bifocal (1987), exemplifies Fauteux’s notion of sculpture being radically different from everyday objects that are of a basic symmetry. Fauteux “flips” the everyday notion of bifocal glasses by changing both scale and materials, omitting the lenses completely and negating the very purpose they serve. Fauteux has changed our vision of what we expect and have come to know by forming something new to see. Born in 1946 in Dunville, Ontario, Canada, it was when he moved to Toronto in 1969 that Fauteux started to focus on sculpture. Fauteux showed with Sable Castelli Gallery in Toronto for over 25 years and has exhibited throughout Canada, Spain and the United States. His work is included in numerous collections, including the Art Gallery of Ontario, Toronto; the Museum of Fine Arts, Boston; the Canada Council Art Bank, Ottawa; the Agnes Etherington Art Centre, Kingston, ON; the Portland Museum of Art (Clement Greenberg Collection), Portland, OR; the National Gallery (Douglas Duncan Collection), Ottawa; the City of Barcelona, Spain; La Rectoria, Sant Pere Villamajor, Barcelona, Spain, the Museu d’Art Contemporani de Barcelona, Spain; the Winnipeg Art Gallery, Winnipeg; the Art Gallery of Windsor, Windsor, ON; the Art Gallery of Nova Scotia, Halifax, and more. André Fauteux: Ten Years, a major retrospective of Fauteux’s sculptures toured nationally in 1982-83.
the modern.toronto is excited to announce a new exhibition of paintings by Françoise Sullivan, Sullivan at the modern. Françoise Sullivan (1923–) was born in Montréal, where she initially studied at the city’s École des beaux-arts. This uniquely multifaceted artist first gained renown as a dancer and choreographer, moved to sculpture and conceptual art in the 1960s and 1970s, and then made a return to painting in the 1980s, a practice she continues to this day. Along with Paul-Émile Borduas, she was one of the founding members of the avant-garde Automatiste movement, as well as one of the signatories of its 1948 manifesto Refus global, which included the entire text of Ms. Sullivan’s celebrated lecture on “La danse et l'espoir” [“Dance and Hope”]. Her work has been shown in countless solo and group exhibitions, including at the Musée d'art contemporain de Montréal (1981), the Musée national des beaux-arts du Québec (1993) and the Montreal Museum of Fine Arts (2003). She was awarded the Paul-Émile Borduas Prize in 1987 and is the recipient of two honorary degrees. The Musée d'art contemporain de Montréal is currently organizing a retrospective of her work, which will open in the fall of 2018.
the modern.toronto est heureux d'annoncer une nouvelle exposition de peintures de Françoise Sullivan, Sullivan at the modern. Françoise Sullivan est née en 1923 à Montréal, où elle a reçu une formation à l’École des beaux-arts. Artiste polyvalente et singulière reconnue à l’origine comme danseuse et chorégraphe, elle est passée à la sculpture au cours des années 1960 puis à l’art conceptuel vers 1970. Elle revient à la peinture dans les années 1980, pratique qu’elle poursuit depuis lors. Aux côtés de Paul-Émile Borduas, elle a fait partie des membres fondateurs de l’automatisme. Elle signa en 1948 le Refus global, manifeste de ce mouvement avant-gardiste auquel fut annexé le texte intégral de la célèbre conférence de Mme Sullivan, "La danse et l’espoir" a été inclu, plutôt qu’annexé. Ses œuvres ont fait l’objet d’innombrables expositions individuelles et collectives, notamment au Musée d’art contemporain de Montréal (1981), au Musée national des beaux-arts du Québec (1993), et au Musée des beaux-arts de Montréal (2003). Lauréate du prix Paul-Émile Borduas (1987), elle détient deux diplômes honorifiques. Le Musée d'art contemporain de Montréal organise actuellement une exposition rétrospective, qui aura lieu à l’automne 2018. The exhibit surveys Sullivan’s prolific nearly 40-year painting career featuring 17 paintings from 1980 to paintings completed this past year. In addition, there are seven black and white photographs from the 1940s documenting her famous dance performance Danse dans la Neige (Dance in the Snow). The exhibit begins with Sullivan’s return to painting with Tondo 6 (1980) after spending the ‘60s and most of the ‘70s constructing large-scale welded metal sculptures. The Tondo series are circular canvases that have been cut and reassembled, combining Sullivan’s sculptural investigations with her renewed painting interests. The second gallery includes two painting from 2015’s Proportio series, with diagonals of muted colors juxtaposed by the squares and rectangles of blues in the diptych Blue/Bloom (2016). Océan no.2, from the Océan series of 2005-2006, continues the slight variations of a field of shimmering blue hues. Sullivan’s 2016 series Only Red concludes the exhibit with an intensive exploration into an increasingly limited and repetitive range of reds making a direct appeal to the viewer’s senses. Danse dans la Neige (Dance in the Snow) was originally envisioned as one installment in a four-part piece on the four seasons in which Sullivan would improvise while interacting with the elements. Performed in silence except for the sounds of nature, her breathing and the crunch of the snow, and without an audience, it was captured on film and in photographs. Sullivan eschewed the rigid and formulaic movements of classical dance, which she was accomplished at, for more improvisational expressive and unconstrained gestures and emotions — not unlike her painting — one art process informs the other art process. At 93 years young, Sullivan is known for her immersive large-scale paintings. 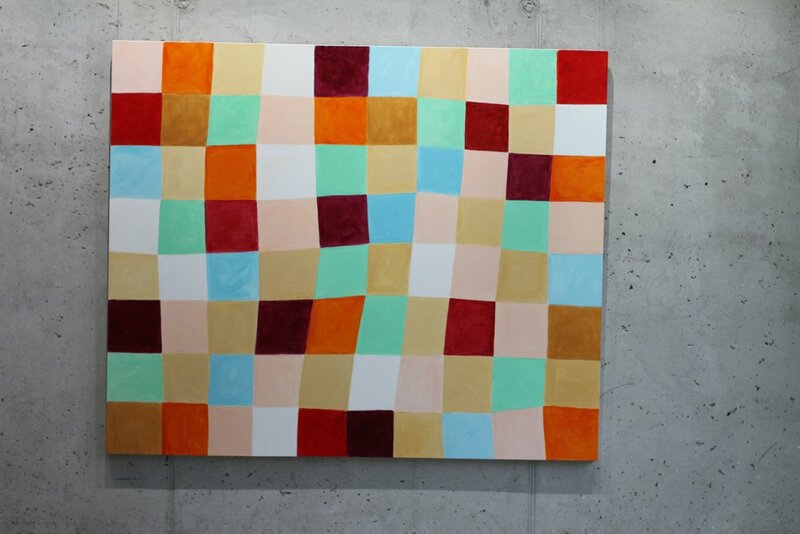 Sullivan at the modern explores her more intimately sized paintings. Sullivan’s deceptively minimal color abstractions resonate with an interior energy of emotions and poetic gestures delicately nuanced in colour and form. The glow emanating from deep within each canvas brings forth a tenuous harmonization. Françoise Sullivan was born in Montréal in 1929, where she initially studied at the city’s École des beaux-arts. Along with Paul-Émile Borduas, Sullivan was one of the founding members of the avant-garde Automatiste movement, as well as one of the signatories of its 1948 manifesto Refus global (Total Refusal), which included the entire text of Sullivan’s celebrated lecture La danse et l'espoir (Dance and Hope). By the 1950s she was focused on dance and choreography. In the ‘60s and ‘70s she was making sculptures, and while never fully abandoning painting, it was not until the late ‘70s that Sullivan returned to abstract painting. She is in several museum collections, including the Museum of Modern Art, NY; the National Gallery of Canada; the Art Gallery of Ontario; and the Musée National des Beaux-Arts du Québec. Solo and retrospective exhibits include the Musée d'art Contemporain de Montréal, 2018; Art Gallery of Ontario, 2010; Montreal Museum of Fine Arts, 2003; and the Musée National des Beaux-Arts du Québec, 1993. Sullivan was included in the Museum of Modern Art’s major 20th century summary exhibition, On Line: Drawing Through the Twentieth Century, 2011. She was awarded the Paul-Émile Borduas Prize in 1987 and is the recipient of two honorary degrees. “Chaos is order”! One sunny afternoon, during one of our conversations, and out of the blue, Jiri uttered this preposterous, axiomatic claim. Jiri does not seek approval and, often, he does not refer to authorities. There is no hesitation or doubt. He observes and concludes. Jiri sources from his own, lifelong, intuitive research, from his universal connection. As soon as Jiri’s hands touch an object, he immediately connects with its underlying laws, no matter how invisible, complex or controversial or unreasonable they may be. Consequently, without a trace of condescension, he accepts the limitations of human reasoning. Jiri has a contract with Kosmos. Jiri Ladocha is an old soul. Born in an old country, he has absorbed its tumultuous history. He ingested millennia of exquisite cultural evolution. From old masters he learned to appreciate skilled craft, patience and perfection. As well, Jiri is a young soul. To this day, after six decades of constant creative output, Jiri’s relentless curiosity and unwavering inquisitiveness urges him to search, experiment, innovate and ask questions. “Architectonics”! Jiri practices visual philosophy. He elevates his art objects way beyond their physical, three-dimensional limitations… material becomes immaterial, engaging us in a meta-material narration. Deep inside, below his legendary surfaces we hear muffled murmurs, whispers, pain, joy, wailings and sobs. They harbor memories of entire civilizations, which came back to haunt us and warn us, while caressing our souls. Jiri’s creations… are they monuments, mementos, shrines, shields or obelisks? I believe they are but there is more, much more! Jiri takes us further. He opens the evasive gateless gate that lets us descend into the unfathomable labyrinth of systems, theorems, and fugues and eventually, the ultimately uncharted realm of the ever-elusive strange loops.